Catching up on some style and travel from the past month – it’s been such an amazing journey cruising through the world non-stop! 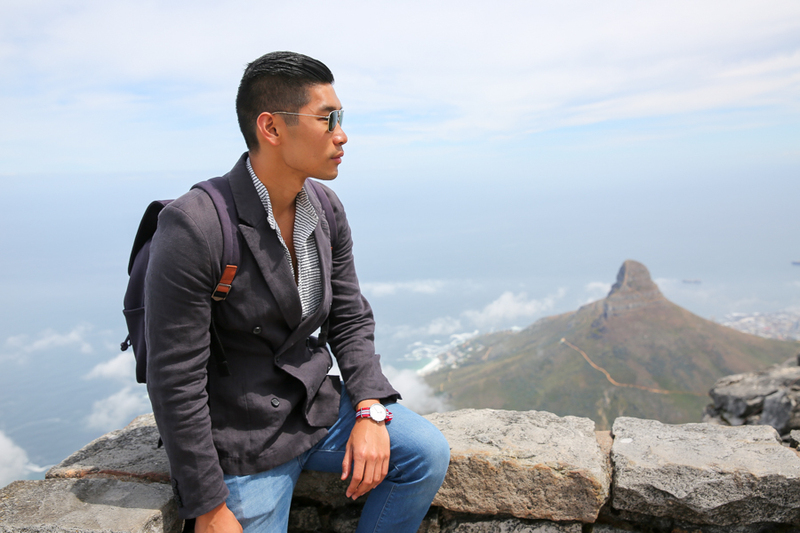 We were very fortunate to spend a few days in the awesome city of Cape Town. 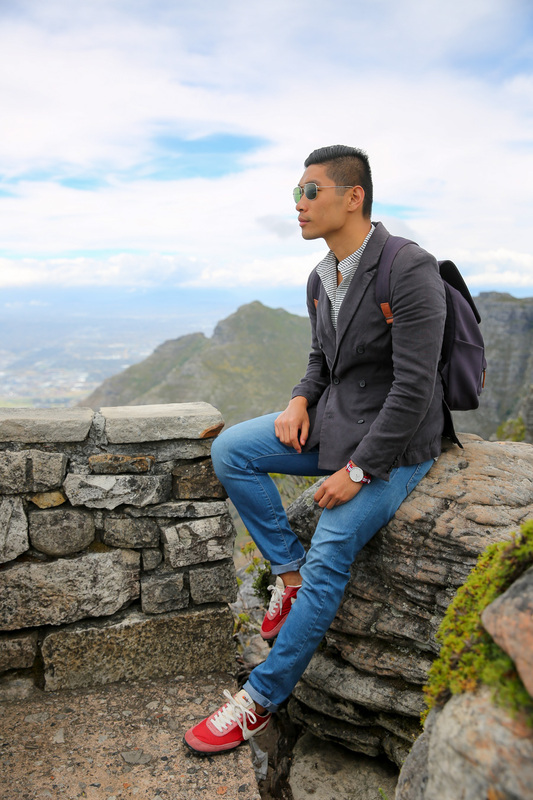 There’s so much to do in this busy part of South Africa from the famous Table Mountain, to the Safari and Cape Point for some breathtaking scenery. 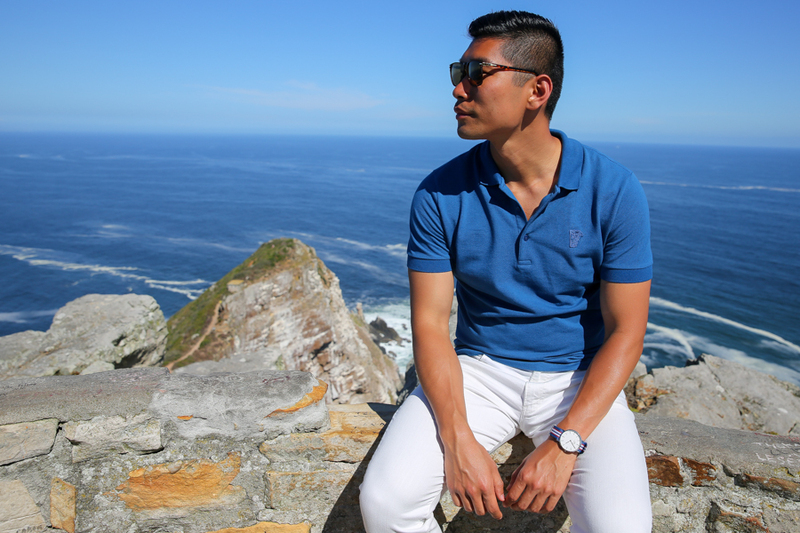 Aside from various activities, Cape Town also feels like four seasons in one day so here’s a quick guide on what to wear in Cape Town. I knew I wanted to go with a sharp casual style look with a light layering and some sneakers for all the walking. 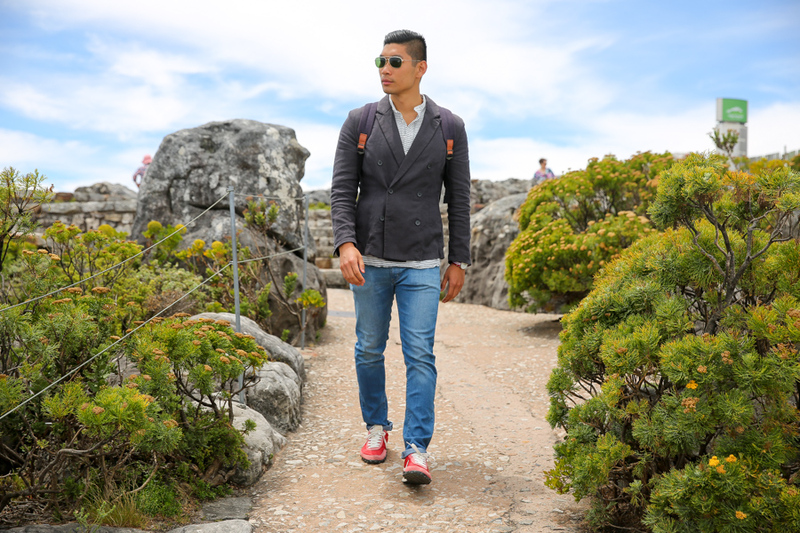 Since we were going up to Table Mountain, the temperature can change quite a bit from the heat in the city to the cool breeze high up. My base layer is a band collar seersucker shirt preparing for the afternoon heat in South Africa. I layered the look with an unconstructed double-breasted blazer whenever I needed some cover. 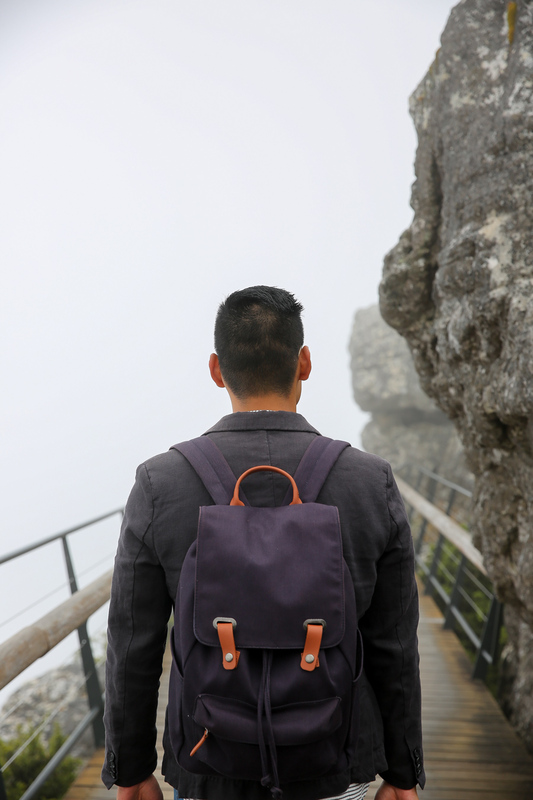 The blazer can easily fold and be stored in my backpack. It was also very useful when I had to dress up a bit for dinner at the restaurant. Headed out of town for the day to check the Safari in a sharp black polo and a pair of camo loafers. 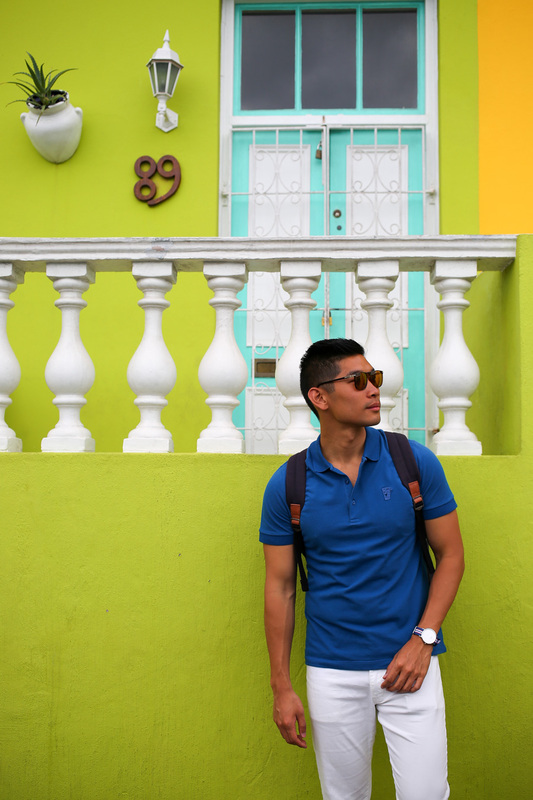 The black polo is a great essential item especially for traveling since it matches with anything. 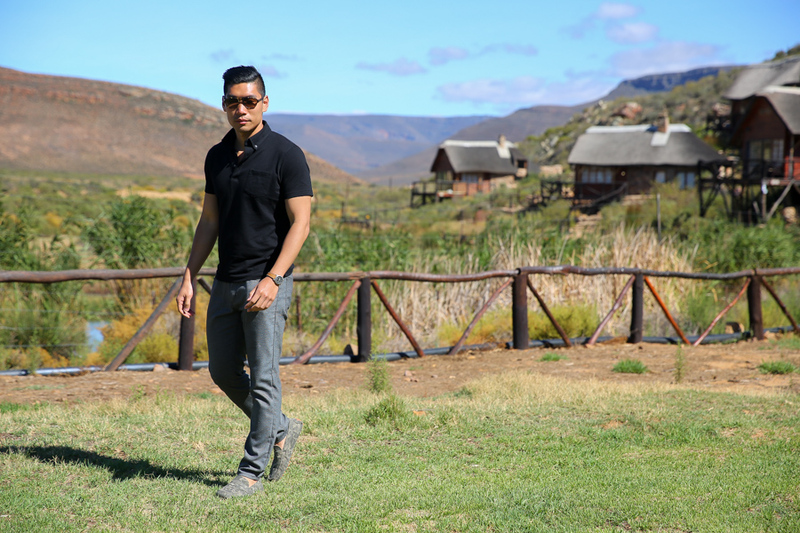 The outfit was perfect for a mild-hot day out to see the Big Five animals in the safari. The polo and stretchy dress pants made it comfortable to move around and snap photos from the rugged vehicles. Finished off the minimal outfit with a pair of camo loafers which just fits the whole theme perfectly! 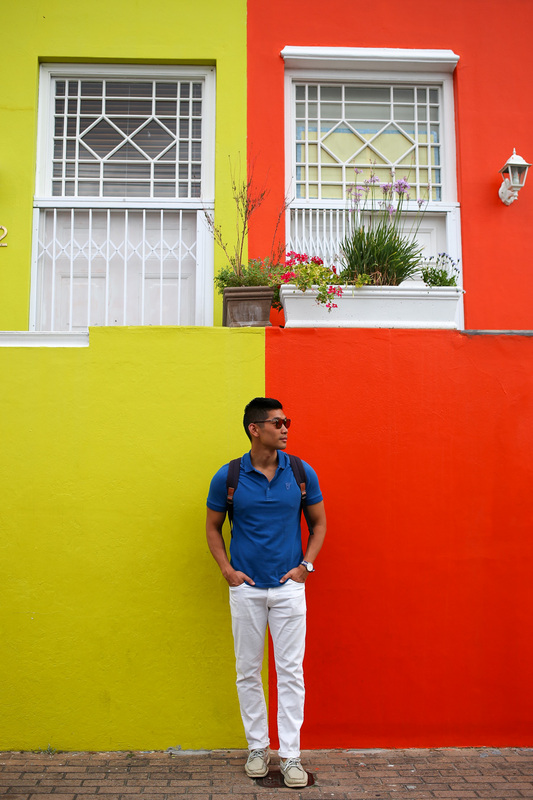 From the colorful houses of Bo-Kaap to the amazing views of Cape Point, I wanted to match the vibrant colors and scenery. 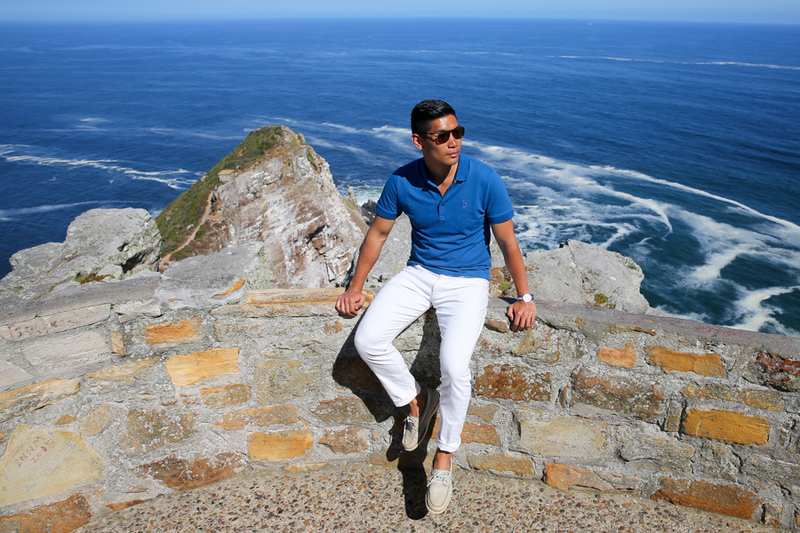 I found this great and simple combination of white jeans and my new Versace polo from Century21. Also rocking some bright orange lens sunglasses for extra pop and a complementing watch strap. 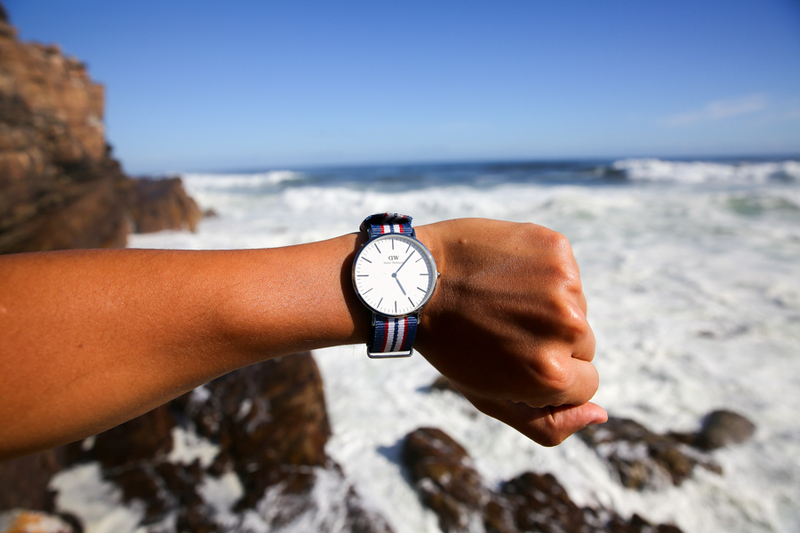 It never fails to match your surrounding for the outfit. Nice DB look, you always dress down the tailored pieces well. The last few colorful shots are my favorite though. Hope you enjoyed your trip! I am very happy to see this type blog. it is very useful and exciting. the best blessings of this article is giving properly idea to each and every readers and also it's giving correct impressions. Looking forward to new blog. Well, must say that the whole outfit looks very balanced. I like that you share not only story and personal experience, but the awesome photos too. Thank you for writing such completed articles. To get the free word search puzzles online then use my link for free to play this game for free.